The Ultimate Quest was published in 2001 by Roland Oliver Ltd and is written by William Lynhope. A 68 page hardback book with black and white photographs and illustrations. ISBN 0 9540716 0 3. Follow the quest of Simon Perceval and the Knights Templar before him for a prize guarded by a Keeper. Answer the Keeper's questions by following the codes and clues in the books and be the first to contact the grail keeper to claim an oak box containing a priceless replica of the coveted subject of the original ultimate quest. This quest contains no element of chance - the questions must be answered using the book and your own research and the Keeper of the prize located and contacted. After some promising in-roads on a number of bulletin boards, progress on this hunt, amongst its followers, slowed down a little. However, the publishers have reported that in late April 2004, "the first quester made contact with the Grail Keeper. Unfortunately, he was unable to answer all five questions correctly, so his quest is not yet complete." After 10 years the publishers announced the hunt would end on 30 June 2011, whether solved or not. After 10 long years, we have decided to bring The Ultimate Quest to an end. Many thousands have embarked upon it and a few have come close to completing it. The Quest will, therefore, come to an end on 30 June 2011. Assuming it is not completed in the meantime, some time during July we will try to put people out of their misery; or at least confirm whether they were on the right track. We will be left with a rather valuable chalice and oak case. If, in these difficult times, there is anyone out there who would like the satisfaction of owning it (having struggled so long to find it) we might consider selling it. More about that in July. "Unless The Ultimate Quest is completed in the manner prescribed in the book by May 2007, we intend to offer an alternative method for completing it. This may or may not produce an outcome, but it will provide an opportunity for those who believe they are close to answering the five questions posed in the book. A few weeks before the Feast of Pentecost (a time associated with the quest for the Grail) we will post these variations to the rules on our website and also advise any forums that we are aware of. In order to submit a valid entry, it will be essential to have a copy of the book. So, if The Ultimate Quest has been relegated to the attic, now is the time to find it again. If, in frustration, you have given or thrown it away  you will not be able to enter. Roland Oliver Ltd (Dec ’06)"
"Last December, we promised an alternative route for those who still wished to try to complete The Ultimate Quest. At the beginning of this week, to coincide with Pentecost (the traditional time for questing), a new website went live to offer this alternative. As most of the main search engines are unlikely yet to have it, here is the address: http://thegrailkeeper.co.uk"
Roland Oliver Ltd (May ’07)"
"There are still quite a few people out there trying to complete this hunt and new ones still embarking on the Quest. It has been noticed, however, that some of the 'old hands' have driven themselves into a cul-de-sac; with some correct answers and a few wayward guesses! In order to try to unblock this log-jam, it has been decided to offer a little assistance; without divulging actual answers, as this would give newcomers an unfair advantage. In general, questions 1, 2, & 5 appear to have been correctly solved by those who have submitted answers. Answers to questions 3 & 4 are usually incorrect. As to question 6 (the 'new' question), no-one seems to have fathomed this cryptic clue. 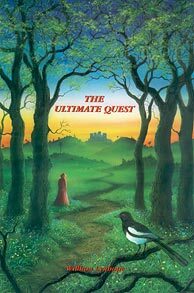 Roland Oliver Ltd (July ’10)"
The Ultimate Quest was available in bookshops or from the publishers - either via the website or by post to: Roland Oliver Ltd, Boston House, Grove Technology Park, Wantage, Oxon OX12 9FF.